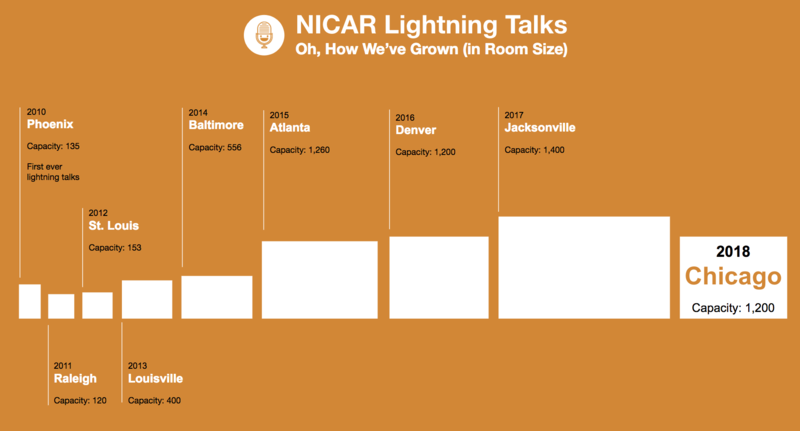 In 2010, the annual data journalism conference known as NICAR featured “lightning talks” for the first time—a series of rapid-fire, five-minute talks proposed and voted on by conference attendees. “It’s an amuse-bouche for the mind,” wrote Aron Pilhofer, then the Interactive News Editor at the New York Times (now James B. Steele Chair in Journalism Innovation at Temple University), in a NICAR-L listserv email soliciting talk submissions to the web app he had built to tally the votes. A common fixture at tech conferences (the term was allegedly coined at the Yet Another Perl Conference in 2000), lightning talks were virtually unheard of in journalism back in 2010. I still had no clue what they were while preparing to attend my very first NICAR in 2016. By then, the “news nerds” had already embraced lightning talks as NICAR’s most popular event, and the session attracted most if not all conference attendees. It’s hard to say exactly how many people attended the first NICAR lightning talks (I’ve heard numbers ranging from 20 to 40), but room capacity is a good indicator of how the audience has grown. Source: Sisi Wei, who originally created this graphic for 2010–16; hotel floor plans for 2017–18. Microphone icon by Julien Deveaux from the Noun Project. But I wasn’t a news nerd yet. I had, quite literally, just started my OpenNews fellowship at the Los Angeles Times Data Desk (my boxes were still en route from D.C. to L.A.); I had never worked in journalism (or tech) before; and I barely knew what NICAR stood for (the National Institute for Computer-Assisted Reporting, in case you’re still learning, too), much less what the lightning talks were all about. I pitched one anyway, after reading this Medium post by ProPublica’s Sisi Wei, the moderator of the talks, encouraging newcomers to submit. “If you don’t pitch a lightning talk, you won’t be giving one. Guaranteed,” she wrote. 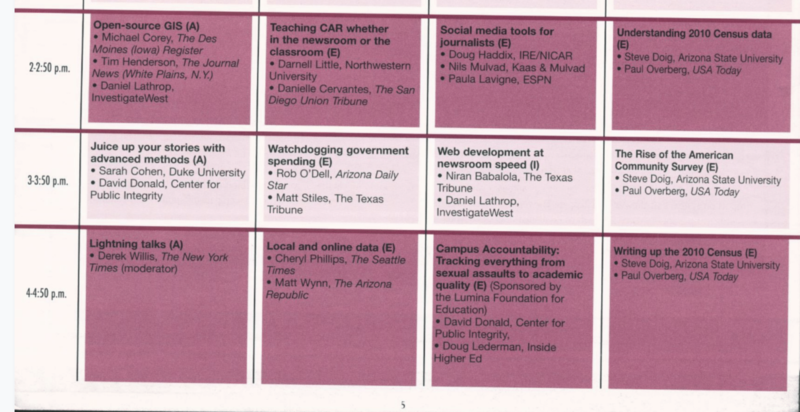 The next year, I still felt like a NICAR newbie, but my talk about the history of data journalism, as seen through two decades’ worth of NICAR programs I had collected, got voted into the top 10, meaning I would be one of the presenters at the conference. Standing in front of more than a thousand people at NICAR 2017, I was slightly terrified—not least because I was up first and trying to channel Lin-Manuel Miranda—but so thankful for the community I had come to know, and for the lightning talks as a platform for NICAR veterans and newcomers alike to have their voices heard. With history on my mind at this year’s NICAR in March, I started wondering: has it always been this way? Aside from room size, how else have the lightning talks changed? To find out, I crunched the numbers on every single lightning talk ever proposed. I have, after all, more or less become the unofficial NICAR librarian and archivist ever since my talk in 2017. So let’s rewind to 2009. Derek Willis, Pilhofer’s then-team member at the Times (now a News Applications Developer at ProPublica), had proposed the idea of including lightning talks to the conference organizers that year. At NICAR 2010, he emceed the session, which featured the 10 highest-voted talks that had been submitted to Pilhofer’s site. Crammed into a small conference room and competing with three other events scheduled during the same 50-minute slot, it was far from the most popular NICAR session (being labeled “(A)” for “Advanced” on the conference program, while the other three sessions were marked “(E)” for “Everyone,” likely didn’t help). The 2010 conference NICAR program for the afternoon of Thursday, March 11th, showing the time slot for the first ever NICAR lightning talks. They were marked “(A)” for “Advanced,” while the concurrent sessions were marked “(E)” for “Everyone.” Future programs no longer labeled sessions in this way. Source: IRE/NICAR. “We barely had enough talks, and there were more presenters than spectators,” Pilhofer told me. Willis’s recollection is a tad more generous: “Half of the audience consisted of the presenters” that first year, he wrote in a 2014 blog post. Like the conference, NICAR’s lightning talks have evolved substantially alongside the broader “news nerd” community. The sessions themselves have always featured the top 10 (or in the rare case of a tie, the top 11) voted-on talks, lasting about an hour in total. During the early years, though, the speakers and audience were more a reflection of the “techier” side of the conference. They were “more like a rogue session” meant to subvert the traditionally longer speaker time slots to a certain extent, said Brian Boyer, the News Applications Editor at the Chicago Tribune and one of the speakers during the first year of lightning talks in 2010 (Boyer is now a VP at Spirited Media). “Sometimes you don’t need 45 minutes to explain a useful technique or interesting resource,” read the 2010 conference brochure blurb for the talks; this wording remains intact today. I thought this pitch was a joke, or a placeholder pitch to test out the site, but Aron Pilhofer assured me he did in fact present “Cats! Cats! 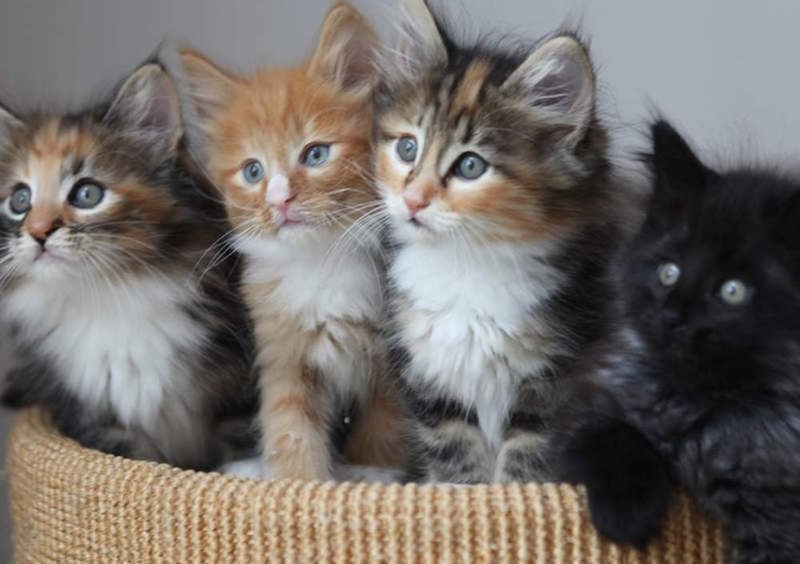 Cats!,” featuring crowdsourced cat pics from NICAR folks. “It is still fondly remembered by, among others, Brian Boyer,” he said. Source: 2012 Lightning Talks app (via Internet Archive). Because the lightning talks differed so much from the “normal” NICAR set-up, it wasn’t a given that they’d take off, said Willis. Investigative Reporter & Editors (IRE), the parent organization of NICAR, was receptive to having a recurring lightning talks session—then-executive director Mark Horvit in particular lent his support, according to Willis—but at the end of the day, the lightning talks were still an experiment. For this reason, he felt the need to attract some “proven names” in the beginning, speakers who were known to draw an audience and who could provide a proof-of-concept for future years. These also happened to be the people likely to pitch to Pilhofer’s site, or to be attentive to the calls for proposals (which went out on channels like NICAR-L and Willis’s personal blog and Twitter account). “They all knew me as the student who dared to give a lightning talk,” she said. Minkoff, now a Data Journalist at The Associated Press, credits NICAR with providing her the skills and sense of community that have contributed to her career in the field. It wasn’t until four years later that another student delivered a lightning talk—Tyler Fisher, a senior at Northwestern and Student Fellow at the University’s Knight Lab in 2014. Fisher, also a first-time NICAR attendee, went on to work as a News Applications Developer at NPR, giving another lightning talk in 2017; he is now a Senior News Applications Developer at Politico. By 2014, NICAR had more than tripled in size. The Knight Foundation decided to sponsor the lightning talks, which now took place in a large ballroom right before the Philip Meyer Award Reception, with no other sessions scheduled at the same time (this has been the set-up ever since). Given that the longevity of the lightning talks was no longer in question, many felt it was time to change up the system. The existing submission site, in addition to being technologically unsustainable for a larger number of visitors and submitters, tended to favor the (nerd) famous at the expense of first-timers, since people could pitch and vote at the same time (voting closed a week or two prior to the conference start date). Seeing pitches as they were submitted could prevent people from putting forward their own ideas if they saw a pitch that was similar to theirs, particularly if it had already been proposed by somebody who was more of a big name, said Sisi Wei, ProPublica’s Deputy News Applications Editor (Wei was a News Applications Developer at ProPublica in 2014). 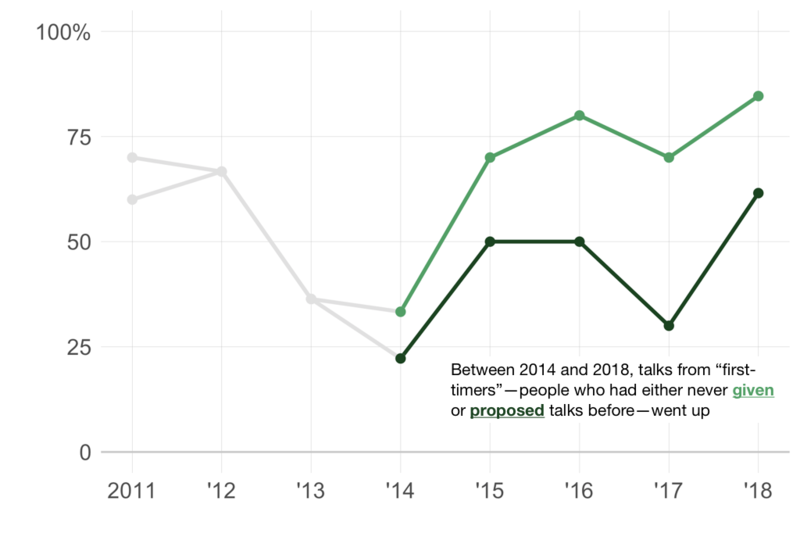 Also, talks submitted earlier were more likely to be selected, since they would be up on the site for a longer period of time, placing people who hadn’t known about the talks or who weren’t subscribers to NICAR-L at a disadvantage. Source: Christine Zhang, lightning talks submission sites. After NICAR 2014, Willis handed over the reins to Wei. “We have so much talent in our community, and five years is long enough for anyone to be heading up a showcase of our brightest,” he wrote, adding that Wei would be making deliberate strides to diversify the pool of proposers. Looking back, he told me he never thought the lightning talks would take off in such a big way. “I think it needed people like Aron and me to get it started, but at a certain point it definitely didn’t need us,” he said. First, talk proposals went up on the page all at once (rather than in real time) the day after the submission deadline, which was three weeks or so before the conference. A weeklong voting period would then begin, and selected speakers would be announced about two weeks prior to the conference start date. Second, Wei chose to randomize the order of the talks, so the ones listed at the top of the page would change every time the site was refreshed (on Pilhofer’s old site, the default view was Newest to Oldest). Third, though visitors could opt to sort talks alphabetically or by popularity, these customized views could no longer be linked to directly; the default view was always Random unless manually changed. In addition to these technical changes, Wei made a specific call to action to first-time attendees, students, and other newcomers to the NICAR community, encouraging them to pitch a lightning talk. “I will coach you, prod you, encourage you, help you figure out your topic, read your pitch and give you suggestions,” she wrote, offering her advice and experience to any potential speakers who wanted it. She had had ample experience and success with pitching lightning talks by that point. To this day, Wei remains the only person to get not one, but two talks voted into the top 10—and she did it twice in a row, in 2013 and 2014 (she opted to deliver only one of them each year). Since 2015, the most frequent speakers—Wei included—have stepped back from giving lightning talks. 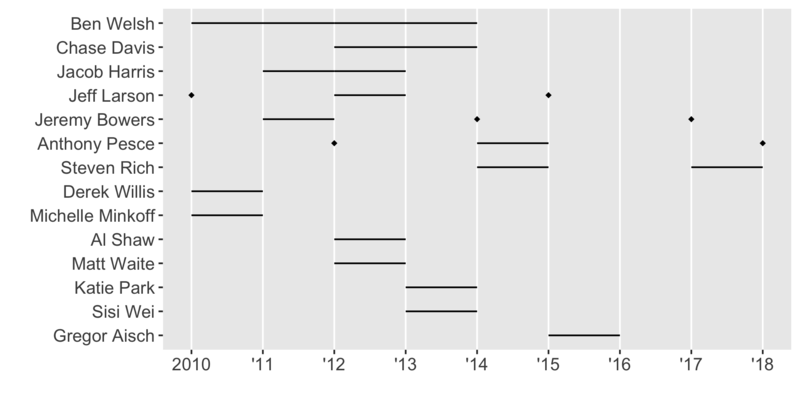 No individual has spoken more than twice in a row in recent years. 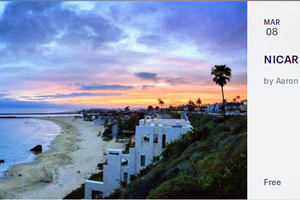 Notes: Anthony Pesce (Los Angeles Times) jointly presented with Lily Mihalik (then-Los Angeles Times, now Politico) in 2015 and with Jon Schleuss (Los Angeles Times) in 2018. Jeff Larson (then-ProPublica) spoke twice in 2013; one was a special joint talk with Jennifer LaFleur (then-ProPublica, now Investigative Reporting Workshop), rescheduled from 2012. According to Wei, this shift has also been somewhat by design. Starting in 2016, the site included a message at the bottom: “… if you’ve spoken in both 2014 and 2015, please take a well-deserved year off and encourage new speakers to pitch a talk.” Wei also told me that she reached out specifically to those who had spoken twice in a row, asking them to consider taking a break from pitching for a year or two. They listened. For the most part, the new system went off without a hitch. Then something strange happened. 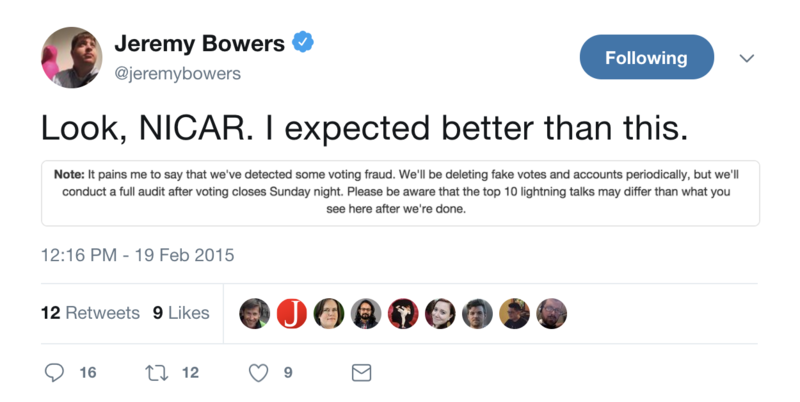 A talk that was at the bottom in terms of popularity suddenly and suspiciously shot up to the top, prompting Bowers and Wei to conduct a vote audit, something they never imagined they would need to do. They discovered that a set of fraudulent email accounts had “voted” for the talk. Although they never found the perpetrator (the person who proposed the talk was not a suspect), they were able to remove the fake votes. They also implemented more security features, like adding an admin view so they could better monitor votes as they came in. The community also chipped in. Jeff Larson, then a Data Reporter at ProPublica, paid for the site to be secured with a SSL certificate so that it could run on https. “I had just finished up reporting on Snowden and … freaked a bit when [I noticed] they were running it on http only,” he told me. It would have been hard to anticipate all these issues back in 2010, when there were only 26 proposals and 224 votes. In 2015, there was a record high of 52 proposals and 1713 (legitimate) votes (2015 still holds the record today, on both counts). The news nerds, of course, were able to rise to the challenge. Over the years, more pitches from first-timers started coming in—and people voted for them. 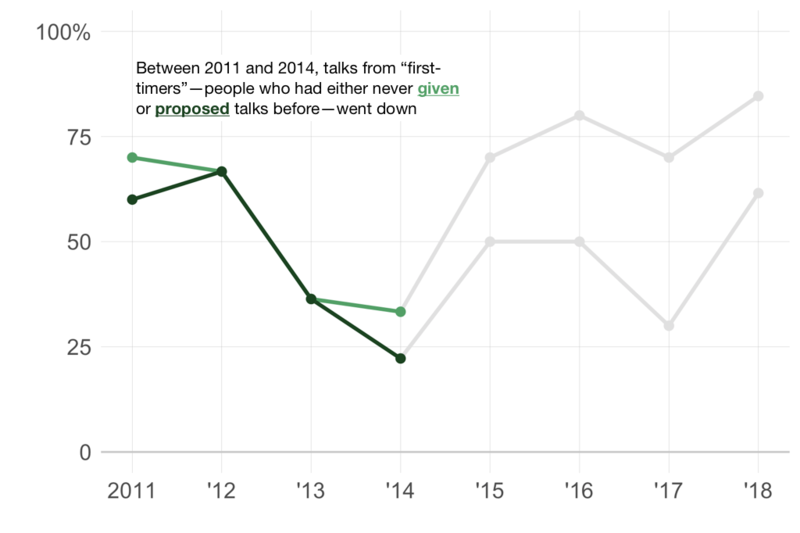 In 2014, just 22 percent of the top 10 talks were from people who had never proposed before; in 2017, it was 62 percent (for people who had never spoken, the figures are 33 and 85 percent, respectively). Student proposals also shot up; in particular, since Tyler Fisher’s 2014 talk, there has been a Knight Lab student speaker every year. The talks have also grown more gender-diverse. Females and non-binary individuals pitched 23 percent of the talks in 2014; in 2016, this figure has more than doubled, to 47 percent in 2018. In 2017, nearly half of the talks voted into the top 10 came from non-male speakers—an all-time high. 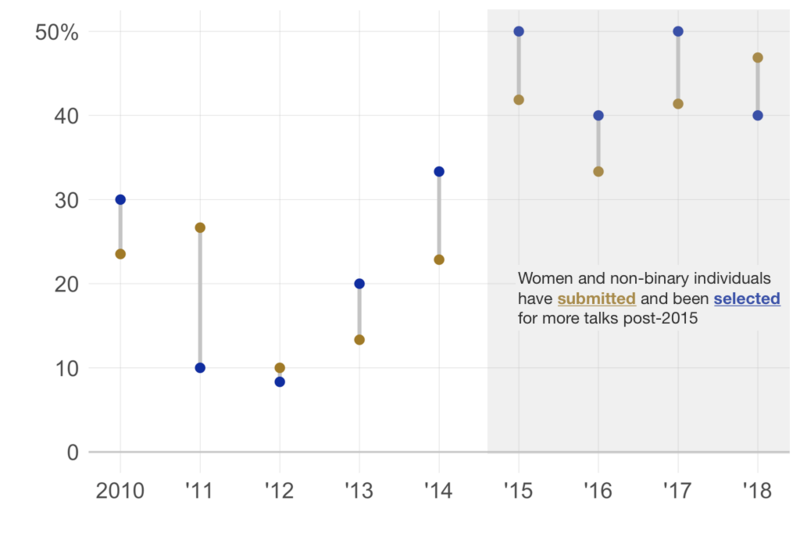 Graph depicts percentage of female and non-binary individuals who submitted talks and whose talks were voted into the top 10 each year. Note in some years the top 10 differs from the actual lineup, due to ties and speaker absences. Source: Christine Zhang, lightning talks submission sites. From Rogue Session to Regularly Scheduled Programming: 2018-?? In January 2018, Wei announced another change: she would be handing the lightning talk reins to her colleague Sandhya Kambhampati, a Data Reporter at ProPublica Illinois. Last month’s conference was the biggest NICAR yet, with more than 1250 attendees. This growth has introduced new challenges in terms of scaling the lightning talks. For example, for the first time since 2014, IRE scheduled other sessions at the same time as the lightning talks—six classes added at the last-minute in response to high demand for hands-on training, according to the conference blog. Competing sessions notwithstanding, Kambhampati is determined to bring a wider range of speakers to the lightning talks. One thing she is considering is anonymizing proposals, so that voters would only be able to see each talk’s title and description—not the name of the person who submitted it. This could allow more new people to submit ideas, she says, by eliminating the “popularity contest” component of the lightning talks entirely. It’s hard to say what effect this change could make on the votes themselves, but the data offers some clues. 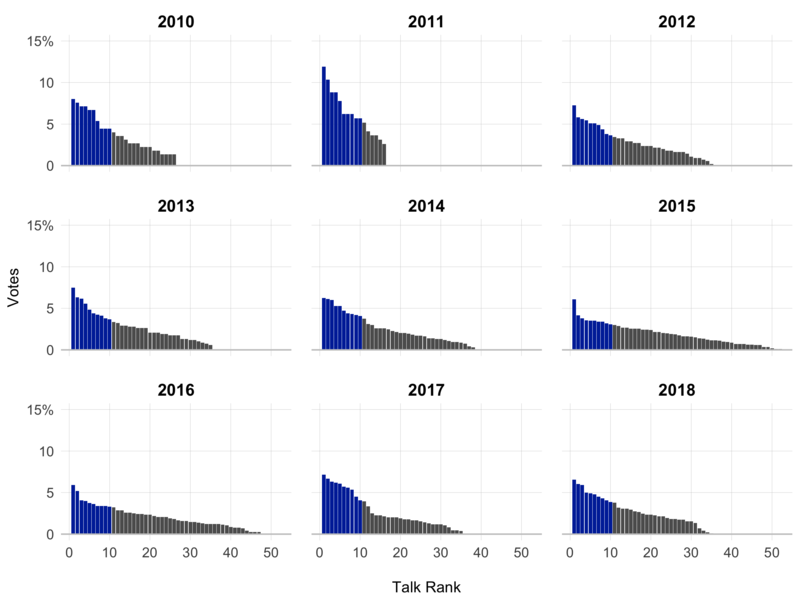 For instance, the top 10 talks got 62 percent of the votes in 2010, and 50 percent of the votes in 2018. This doesn’t necessarily suggest anything wrong, nor is it even that unequal (in the unlikely event that each talk received an equal number of votes in 2018, we’d expect the top 10 to get 29 percent of the votes). But it’s also possible that votes would be more evenly distributed between “the best” and “the rest” if people were voting based wholly on the content of the talk itself, rather than the person delivering it. Additionally, as NICAR’s attendees have grown, so, too has the number of people coming from outside of the U.S. IRE doesn’t have exact breakdowns of attendees by country (here’s a map by Matt Stiles plotting unoffical registration totals by location for 2018), but there has been an internationally focused session every NICAR since 2013’s “Data journalism around the globe,” and 2017 and 2018 both included “International meet & greet” breakfast events, suggesting a growing non-U.S. presence at NICAR. This increasing international presence has not been reflected in the NICAR lightning talks. Though there have been proposals from non-U.S. speakers every year since 2012, only once, in 2017, has one been voted into the top 10 (“How to collaborate when no one understands what you do” by the Guardian UK’s Data Projects Editor Caelainn Barr). Casting a wider net for the lightning talks might also mean encouraging more geographical diversity (nationally, too: most speakers, unsurprisingly, come from New York or D.C.). I asked Wei what she thought about potentially anonymizing the lightning talk pitches. She said she didn’t have a comment either way, but that at the end of the day, it’s not her show anymore—if it ever was. Many thanks to Jeremy Bowers, Brian Boyer, Sandhya Kambhampati, Jeff Larson, Michelle Minkoff, Aron Pilhofer, Sisi Wei, Ben Welsh, and Derek Willis for providing quotes and background for this post. Want to Find Out More? Of Course You Do. GiHub repo with data & analysis code. Links to videos of past NICAR lightning talks below. Presentation links provided for earlier years where possible (no full videos pre–2013). Also check out Chrys Wu’s annual compilation of NICAR links, including lightning talks slides. Christine Zhang is a journalist and data analyst currently based in New York City. She loves stats, stories, spreadsheets, and sandwiches. Christine was a 2016 Knight-Mozilla OpenNews Fellow at the Los Angeles Times Data Desk and has previously worked at the Brookings Institution in Washington, D.C. Follow her @christinezhang.